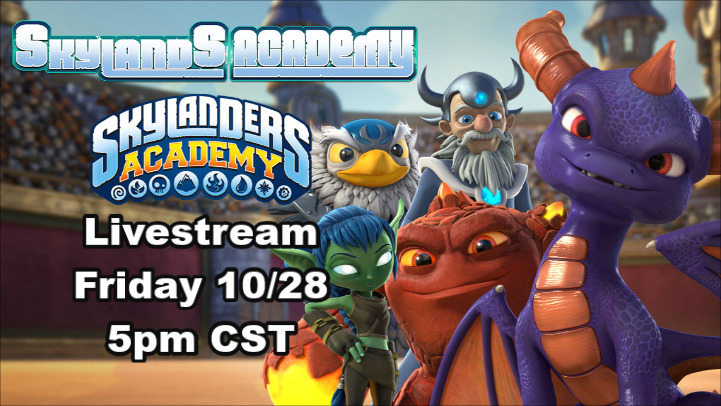 In celebration of Skylanders Academy, we will be doing a livestream on Vaughn Live streaming a few episodes of the TV series Friday, the day of its Season 1 release. Depending on the demand of those who attend, the number of episodes we will watch may change. We haven't decided on the time when our livestream will start, but it will take place in the Central Time Zone. On Wednesday the 26th, we will let you all know exactly when our livestream starts and also WHEN it's about to start to give users and fans time to arrive. If possible, we may even be visited by a special guest! Man,I really can't wait for this! I love Skylanders with all my heart,I also like Spyro and Crash Bandicoot too. I'm a Writer, Designer, Artist, Gamer. I've got big plans, and soon I'll put them to work. Check some stuff out why don't ya? I might join the livestream. Can I ask how to join the livestream? You know, when you start it... and decided on a date. I'd do anything right now to watch at least one episode of the show. For the livestream, we'll put out a link to where you can watch/attend. The time for it is still being determined. Right, that works for me. NICE! If I'm not A. at school or B. at youth, you can count me in! (10-24-2016, 05:17 PM)CrystalBlazier Wrote: For the livestream, we'll put out a link to where you can watch/attend. And wait could we seriously binge watch the entire season?! I totally forgot all the episodes will be up on the 28th. I hope I have that many hours to sit down and watch. If my calculations are right, Photon, there are 13 episodes for season 1; each episode is something in the range of 20-30 minutes, which means over 5-6 hours of watching. I could watch it for that long - as I have played video games for even LONGER in a single session (Ori and the Blind Forest took me 8 hours to knock over in one run) - but the question then is whether my Internet will hold out for that long... and the time of the livestream. If it's anywhere near midnight my time, I probably won't get far. The number of episodes we'll watch depends on those who attend the livestream. I don't know if we'll go on past three hours. (10-25-2016, 09:08 PM)CrystalBlazier Wrote: The number of episodes we'll watch depends on those who attend the livestream. I don't know if we'll go on past three hours. Well, I'm gonna be there most likely so I demand we go the whole 9 yard. BLEH. LOL. (10-25-2016, 08:20 PM)The Primordial Clok-Roo Wrote: If my calculations are right, Photon, there are 13 episodes for season 1; each episode is something in the range of 20-30 minutes, which means over 5-6 hours of watching. You are a Scientist so i trust your calculations. I got netflix on literally all electronics I own. SO I have multiple methods on how to watch it. I'm sure this will be amazing. Ha ha! You make me laugh, mate! Good for you to have Netflix on all of your devices. If I could get it, I would... my Internet isn't good enough for that at the moment. Aww you poor kangaroo. And I'm sure you're super intelligent. I find you to be hilarious too mate. I hope you get to watch it. Thanks, mate! Glad you find me funny! Date and time finalized! See you guys at the livestream Friday! As long as I don't have homework on Friday, I'm in! What time is that Australian time? It may be too late for me. 5pm CST is 9am in Australia. You have to calculate your timezone with CST. That means I'll have to be up early... I usually sleep in past 11am... sometimes noon! Hopefully my Internet holds up! Dammit! I tried watching the stream, but it was so buggy and laggy on my end. You might as well have shown me still shots with disjointed audio, and I'd have not know the difference. Had to cut the livestream short, since livestreaming isn't allowed. Only 2 episodes. Sad that it had to be cut but it was still a great time! I knew it would be cut off, only a matter of time really. I have seen this happen so many times. Let's pray that the show makes it onto Kiss Cartoon soon. Current time: 04-24-2019, 08:19 AM Powered by MyBB, © 2002-2019 MyBB Group.